This naturally coloured carded wool is produced from our own top quality, soft handling Corriedale and Merino type fleeces, which are colour sorted, gently scoured (washed), and then carded into large flat batts of uniform size and thickness, approx 2.4 x 1.8 metres (6’x 8′) in area, and approx 2cm (1″ ) thick. Each whole batt weighs approx 1.3 kg ( approx 2.5lbs) at an average weight/area ratio of 350gm ( 12oz) per square metre (sq yd +). Please note that the weight of whole individual batts may vary from 1.0 kg to 2.0kg each, depending on the processing of each batch. 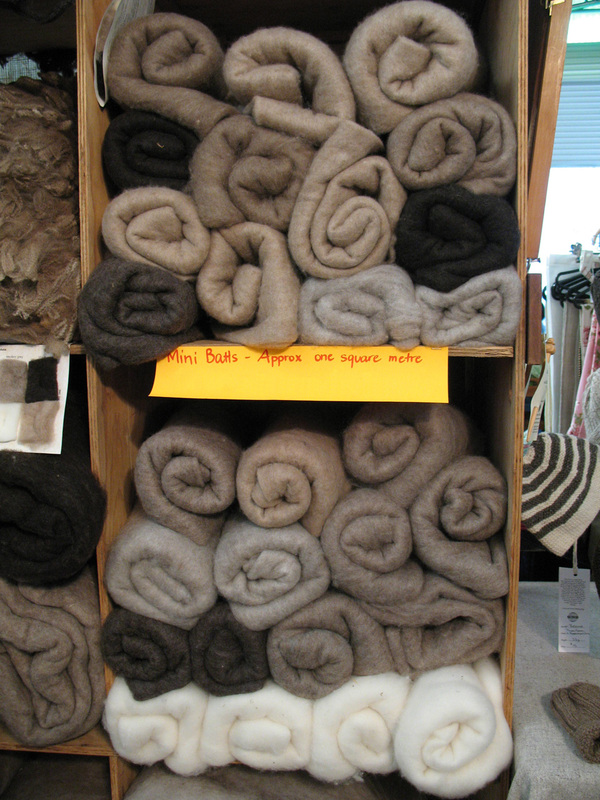 The batts are needled and ready for very quick and easy feltmaking, without loss of time in tedious preparation. Each batt can be split into thinner layers, torn into strips or cut to any size and shape.They are ideal for large projects e.g. wallhangings, floor rugs and garments, and are frequently used by teachers who wish to introduce students to the feltmaking process with a minimum of preparation and quick results. These batts are also suitable for toymaking, quiltmaking, pillow and cushion inserts, baby floor mats and cot quilts, and pet beds. Please note that the wool is not chemically carbonised so a little vegetable matter is to be expected. It is easily removed, or may be left to add natural character. Whole or half batts are sold by weight, plus Australia Post and vacuum packing charges. Smaller mini batts of approx 90cm x 80cm weigh approx 200gm and are sold singly or in packs of three different or similar shades. Please contact us for pricing information.